(Top row) Kelly Boseman, Delta human resources, Anand Jillella, Winship associate director for community outreach; (second row) James Sullo, Delta ground support, Pamela Sutton, Delta customer service, Dave Huether, retired Delta pilot; (third row) Sagar Lonial, Winship chief medical officer, Jewell Hudson, Winship radiation oncology nurse, Walter Curran, Jr., Winship executive director; (bottom row) Michael Kelley, Delta pilot, Keino Friday, Winship medical assistant. Did you see the Winship ad in the October issue of Delta Sky magazine? It reached an audience of more than five million print and digital readers. The photo was taken in front of a 767 aircraft in the Delta Flight Museum in Atlanta. 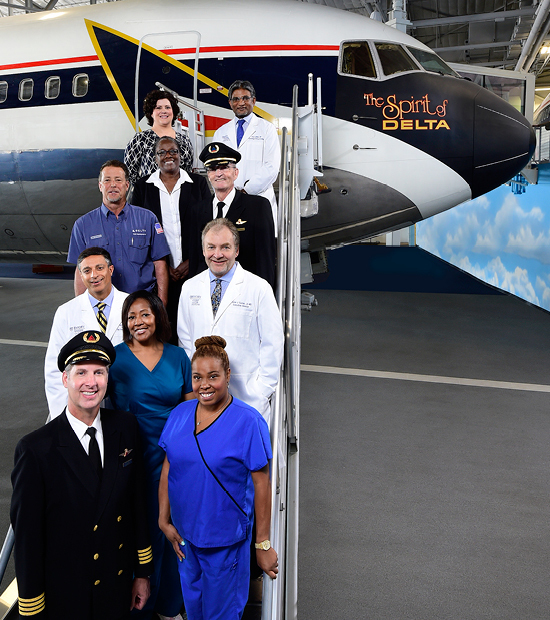 We brought together Winship staff with Delta employees who are also our patients.